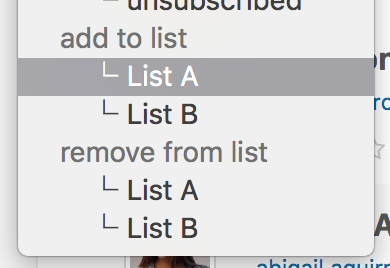 It’s easy to assign subscribers to list with the UI of Mailster. Just select the subscribers you like to assign and select the option from the drop down. To get more specific you need to add some custom code to your website. $subscriber_ids can either be a single ID of one of your subscribers or an array of IDs. $lists can either be a single ID of one of your lists or an array of IDs. Lets assign the subscriber who clicks on the link to “http://example.com” to the List with ID 1. Lets assign the subscriber from a specific campaign (ID 12) to the List with ID 1 and 2 one the campaign was sent. Lets assign the subscriber who opens a specific campaign (ID 12) to the List with ID 1 and 2. Since we don’t know the current subscriber we have to get it from the current WordPress User. This requires an existing WordPress user with matching Mailster Subscriber.